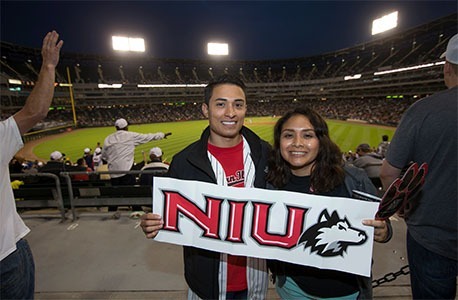 The Chicago White Sox and Northern Illinois University have again partnered to host NIU Day at U.S. Cellular Field on Sunday, Aug. 28, when the Sox take on the Seattle Mariners (1:10 p.m. first pitch). The special ticket price allows fans to purchase lower box seats for only $30. Fans must enter the promo code NIU via the White Sox website to access the discount tickets and be eligible for the one-of-a-kind White Sox–NIU cap. Hat vouchers are limited to the first 1,500 tickets purchased. Fans who purchase tickets for NIU Day at U.S. Cellular Field can redeem the hat voucher at the Sales Booth, which is located behind home plate on the 100 Level concourse, before the 4th inning. The Sunday afternoon game will include the first pitch being thrown by NIU alumnus Joe Minoso (M.F.A. ’04), who stars in the hit TV series “Chicago Fire.” Members of the Huskie Hunks all-male student a cappella group will also be on hand to sing the national anthem. Fans are encouraged to stop by the NIU Alumni Association tent outside of Gate 5 at U.S. Cellular Field from 10 a.m. to noon on the day of the game.